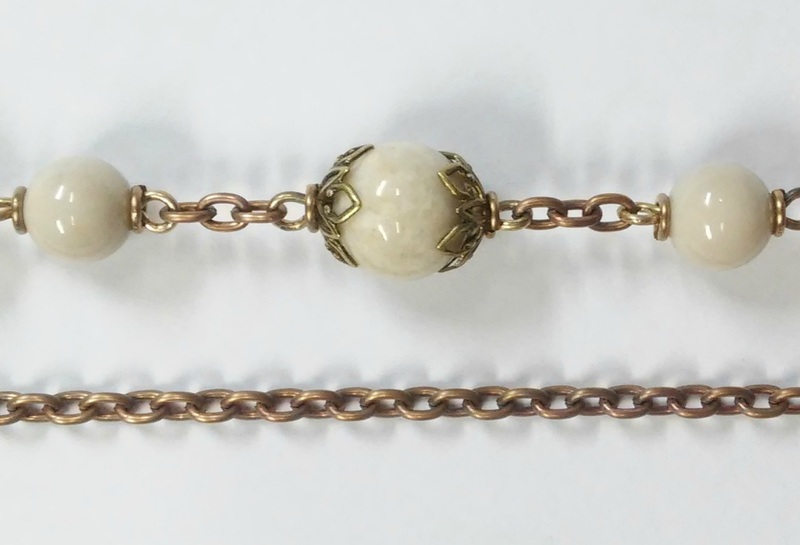 This is a fumed Brass wire with a nice antique patina. 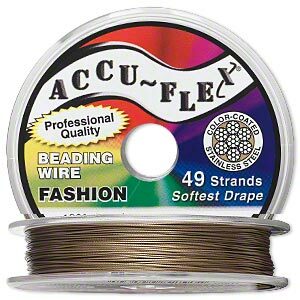 It is the perfect wire for making rosary links or wire wrapping. It is slightly softer than bronze so it may be better if you are just learning to make rosaries. This wire may vary slightly in color from one roll to the next as the patina is a natural process. Available in 19 gauge - super thick for large hole beads, 20 gauge - a great size for most beads, and 22 gauge - good for wire wrapping. This is the bronze wire that matches the Vintage Rosary parts beautifully. Stronger than brass. It creates a super strong rosary. All Bronze wire is not created equal! Many popular brands of wire are called bronze but are actually a bronze colored copper. Copper wire is very soft, and does not keep its shape as well. There are still other bronze wires that have too much copper in the formulation and do not match. My Bronze Wire has the addition of Silicon in its formulation for added strength, resistance against corrosion and the beautiful buttery bronze color. It matches the medals perfectly. This wire is stronger than popular brand names, and will help you create a rosary that will last. Stainless steel is a super strong wire choice. It has the distinct advantage over Silver in that it will not tarnish. Because it is so hard, it could damage pliers. I use Memory sheers since they are not expensive and will give a clean cut on the Stainless steel. I offer SOFT stainless steel wire. But be advised, soft Stainless steel is harder than bronze! Bronze metallic color. 49 strands of Stainless steel bundled together and nylon coated. 0.019 inch diameter. Best strength and flexibility for the Strung Rosary. 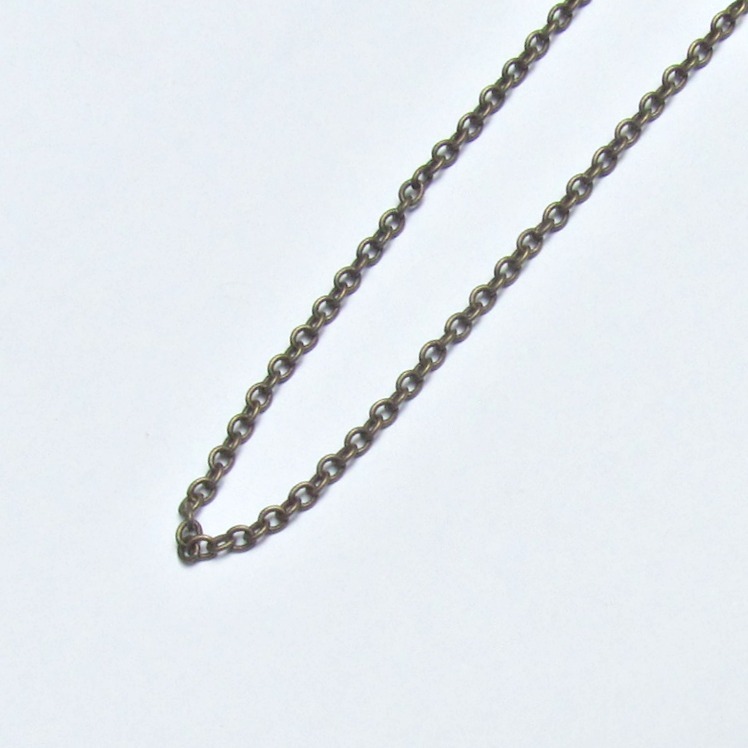 2 sizes of chain for large, medium or small rosaries. Stainless steel cable chain will not rust, tarnish, or oxidize. 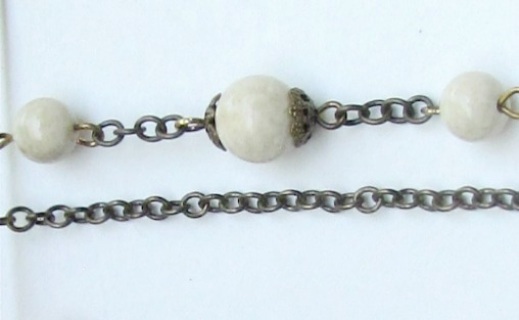 4 x 3.4 mm oval cable chain that works well with 8mm Aves and 6mm Aves. 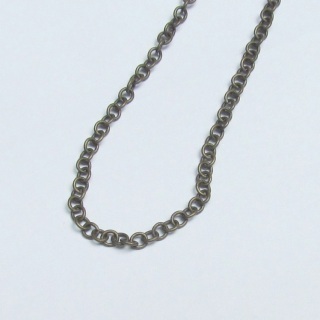 This chain is made of solid bronze....NO plating....light patina. 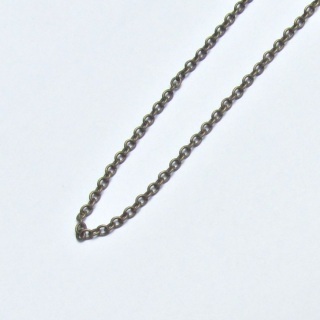 High quality chain, made especially for my store. Photo shows this chain between a 10mm Pater and 8mm Aves. These chains are solid brass. . They are antiqued to match the aged bronze parts. They are a good quality chain that won't break. 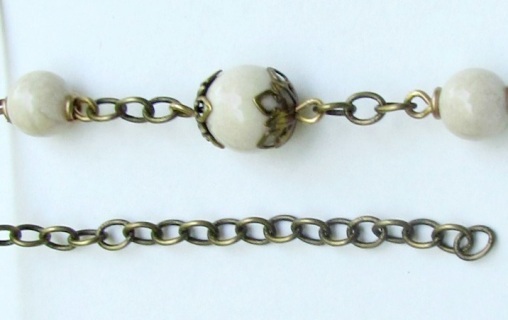 These chains match the antiqued bronze rosary parts beautifully. This is a tiny antique brass cable chain for a 6mm Avel rosary. The links are 2.5x3.2mm . It is solid brass with a antique brass plating, so it will wear very well. The links are soldered, so it is strong. 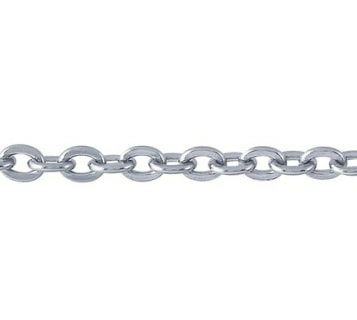 olid brass chain. Measures 3 mm x 4 mm. Suitable for average rosary. Aged solid brass. Links are soldered. 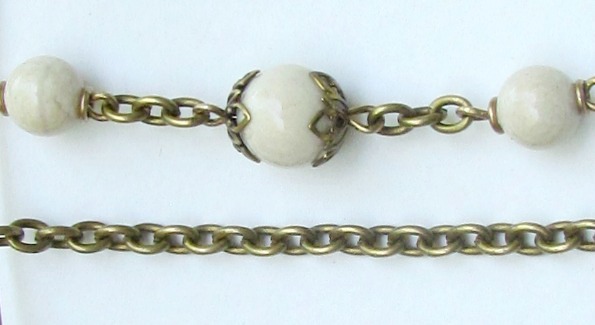 Photo shows chain linked to 8mm Ave beads and a 10mm Pater bead. 1Solid brass cable chain measures 3.1 mm X 4.7 mm. Antique brass plated for even color. 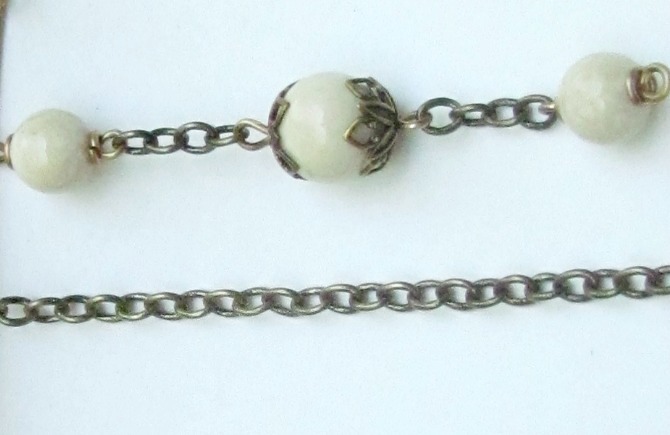 Soldered Links. Figaro Brass Necklace Chain 18"
An 18" necklace chain made of aged solid brass. The link is 1.3 mm thick. 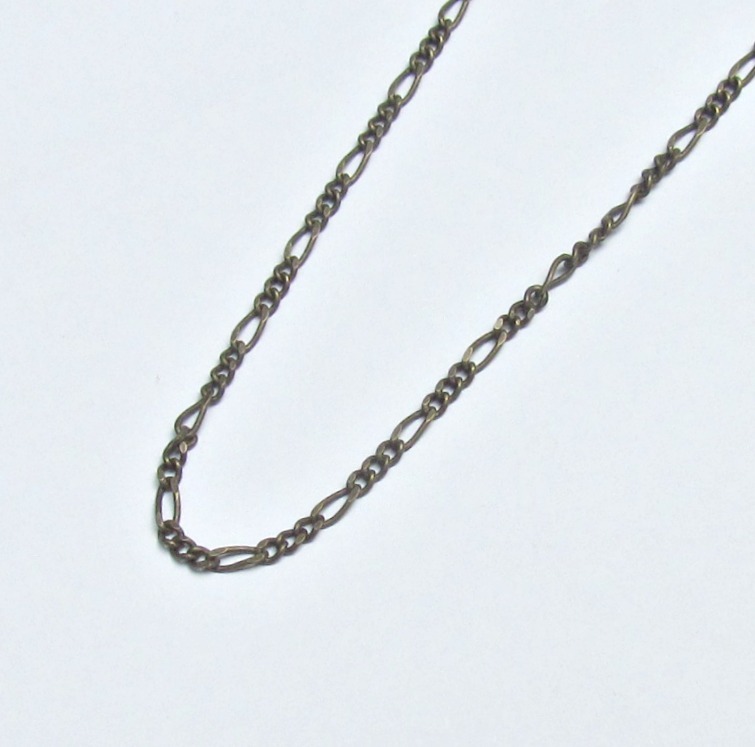 Sturdy Brass Necklace Chain 18"
An 18" necklace chain made of aged solid brass. The link is 2 mm thick.